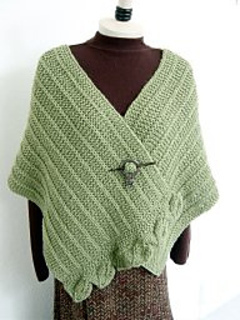 The Shaped Leaf shoulder Wrap combines a lace edge with an easy slip stitch pattern. The leaf panel is worked first. Stitches are picked up along the edge of the panel and a slip stitch pattern is worked for 54” from pick up. The opposite end is trimmed with a band of seed stitch for an asymmetrical look. Make the wrap hands-free by adding a scarf pin. Printed patterns have old mailing address. Current address is 113 N 2nd St, Sterling CO 80751.